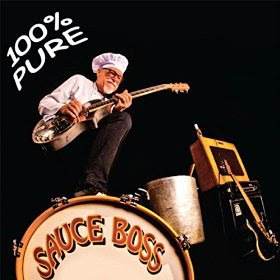 I just received the newest release, 100% Pure, from Sauce Boss and it's one man blast! Opening with Zipper Bird, a rowdy blues rant with Bill "Sauce Boss" Wharton on vocal, percussion and fat groove saturated slide guitar riffs. Marquis De Swamp has a really cool melody with a swampy feel and sophisticated guitar work done in a somewhat primitive manner. The Boss is have a good time with this track but I like it's composition. Super! Gonna Be Alright is a Latin rhythm track with just a simple pop melody. Chains opens with some real fat electric resonator slide work. With guttural singing and voracious slide guitar work this is another real cool track. Delta 9 Blues is a deep blues track again with a strong dose of swamp. I particularly like Boss' vocal style and slide playing on this track. It raw and real. Excellent! Peckerwood has a bit of a country flavor. With it's quick pace and more percussive picked guitar work, this has a definite rural feel. Boss does cut loose with a real nice slide solo on this track and it's wide open. Chicago Combat Zone has a definite blues feel but with more country style picking. Telling the story of his own life in Chicago as a child Boss gets a great electric hollow body metal resonator sound. Cadillac Of A Woman has strong country roots. As much a country ballad as anything, Boss does lay down some real nice lightly amplified acoustic resonator slide work. Hey Wilbur is just a bit of fun and foolishness with backing vocals and muted picking. Sun is a happy go lucky track, again with the smell of back roads and hay. Song Of The Irish Band is a somber acoustic ballad sounding like a mix of Tom Waits and Bruce Springstein. Wrapping the release is Outlaw Blues opens with a pretty heavy guitar riff that actually reminds me of Deep Purple... dig that! A cool blues rocker, this is a great track to close the release. There's no holding back on slide on this track... very cool!